Hey guys! I know it’s been awhile but I needed to take a break from things and just really enjoy Ireland. It was pretty much a life long dream come true to go and I decided that I wanted to focus on the trip and really take it all in. And it was refreshing and beautiful. More than beautiful, really. So beautiful that I’m going to break up the trip into two posts because of pictures. And while we’re talking about pictures, I bought a new camera because you don’t do on a trip like this and rely on iPhone pictures. So we spent the first few days in Dublin, the capital and it was beautiful! It’s not as big as either of us expected with only about a million people in it. What it lacked in size, it made up for in friendliness and beauty. The first night we stayed at an AirBNB up in the NW part of the city which was a charming area filled with Victorian area townhouses. Pretty much every street looked like the picture above. 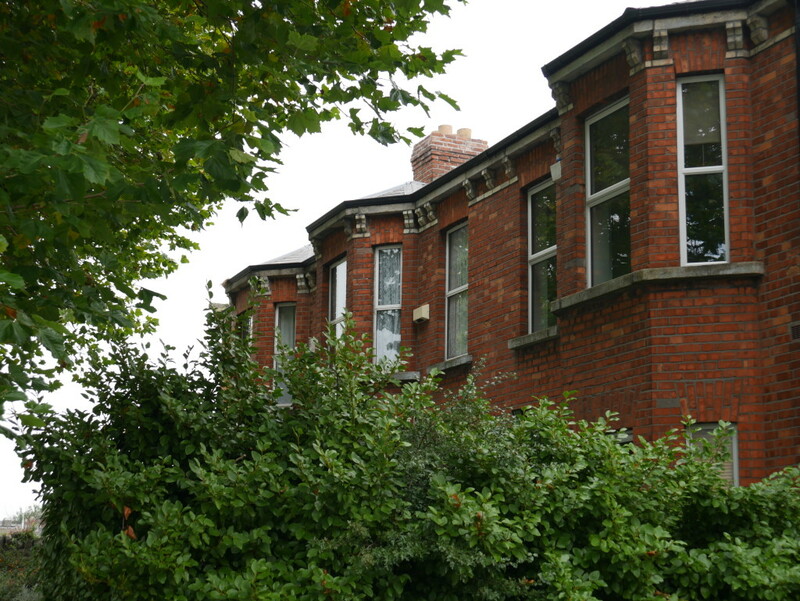 We loved the red brick against the green foliage. It was extremely quiet and picturesque- totally a neighborhood I would think about living in. 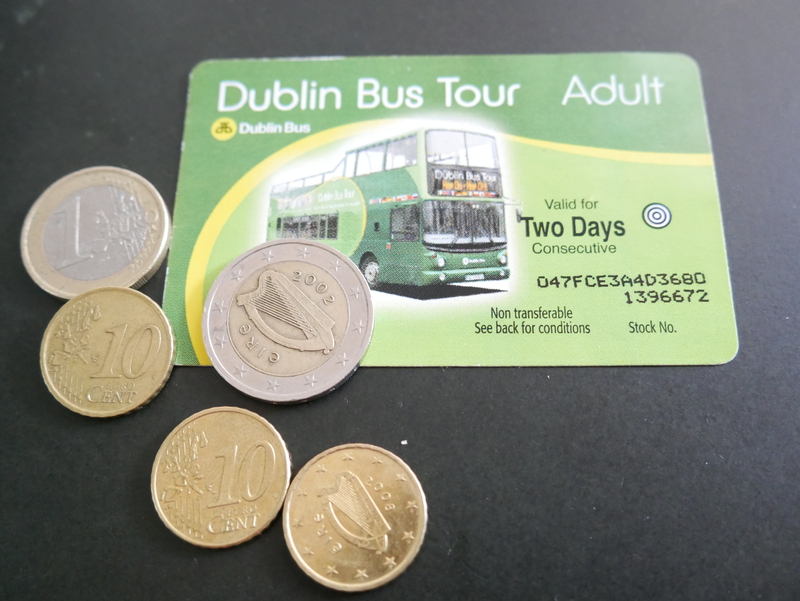 The green sightseeing busses are a great way to see the town and are actually cheaper than buying a city bus pass. The hop on and off feature was amazing for seeing things and even just getting around. One of the husband’s coworkers gave me her’s since she didn’t have time to use it. Changed my life as far as a getting around town and the bus drivers sing Irish drinking songs, so I’m not sure what more I could have wanted. Oh and I’d say only about 60% of places take cash so make sure you’ve always got plenty of cash. Even if you decide to take cabs or buses most places, make sure that you take time to walk around and really see the city. 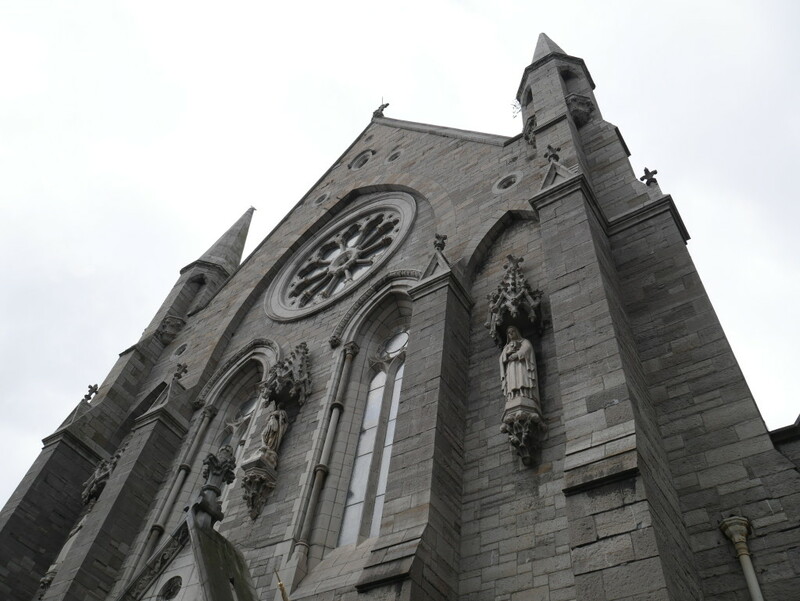 Dublin has so many historical places that only a fraction of them make it on the bus tours. 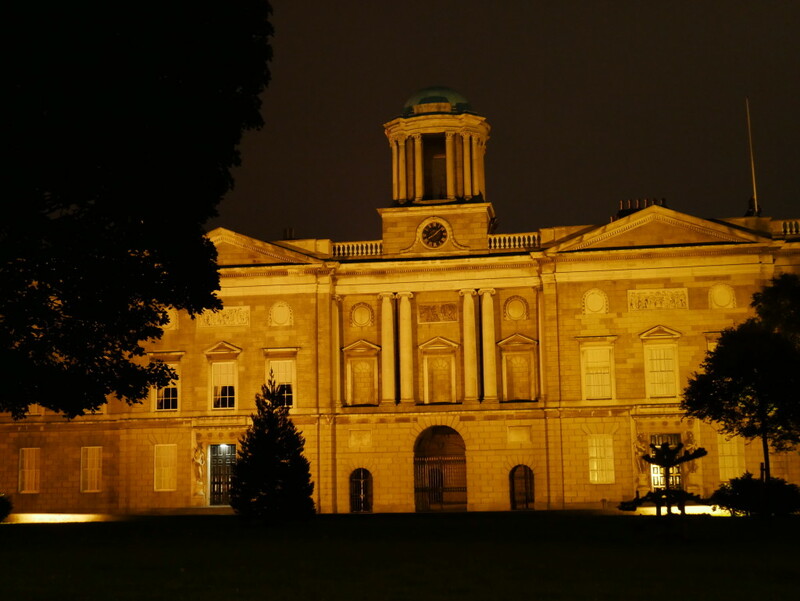 We would have missed seeing this gorgeous building if we hadn’t decided to walk to the pub one night instead of catching a cab. And speaking of pubs, they’re everywhere and the food was actually pretty decent on average. We ate a quite a few of them and loved watching rugby matches with locals. It’s a definite must-do while you’re there, just make sure that you check when they’re open. We missed getting into the beauty because we wanted to eat a little too early. 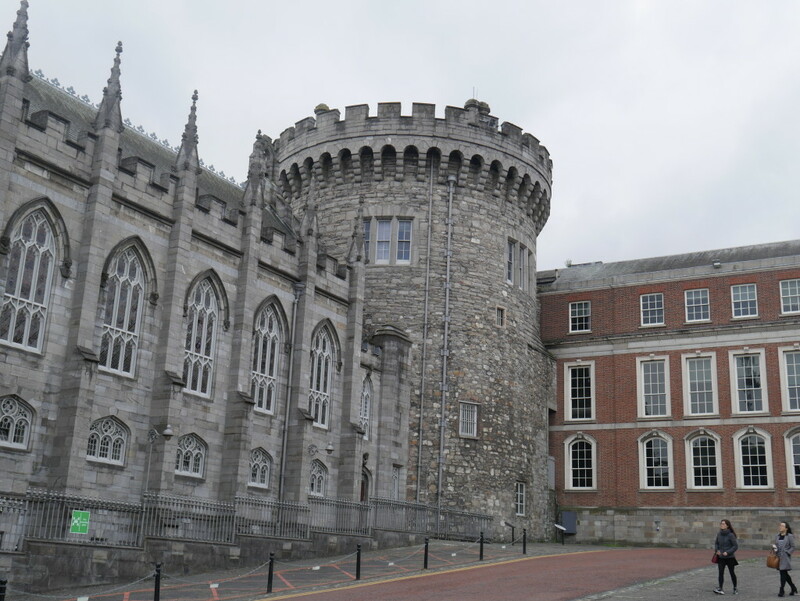 One of the most interesting, fun, beautiful places in Dublin is Dublin Castle. Pay the extra few euros and take the longer guided tour. You get access to more parts of the castle and you’ll learn awesome things about the beginning of Dublin, vikings, Irish independence, etc. It’s a gorgeous hodge-podge of buildings, some almost a thousand years old! The architecture lover in me loves the medieval tower in between the gothic cathedral and the victorian state hall. The cathedral was spectacular breathtaking and while not huge, its detail and craftsmanship rivaled some of the larger famous cathedrals in France. 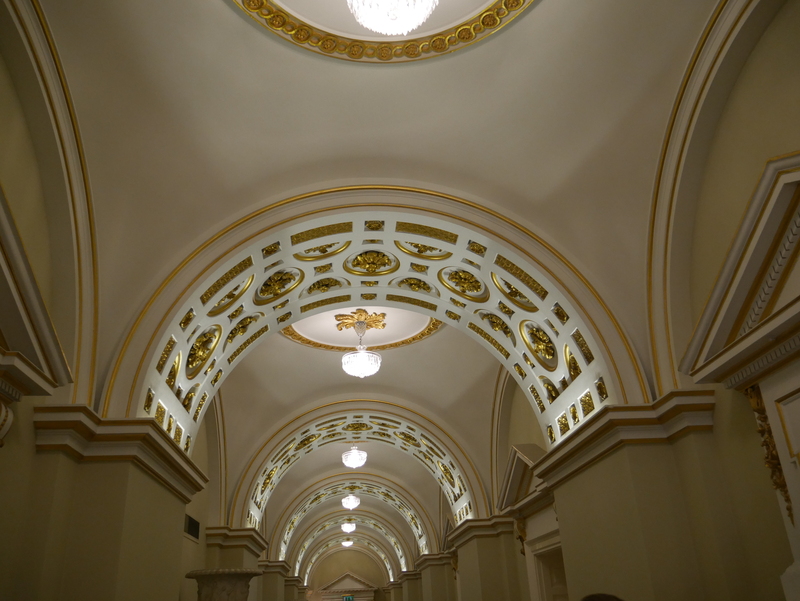 Now I love me some America but our government halls have nothing on their state rooms. 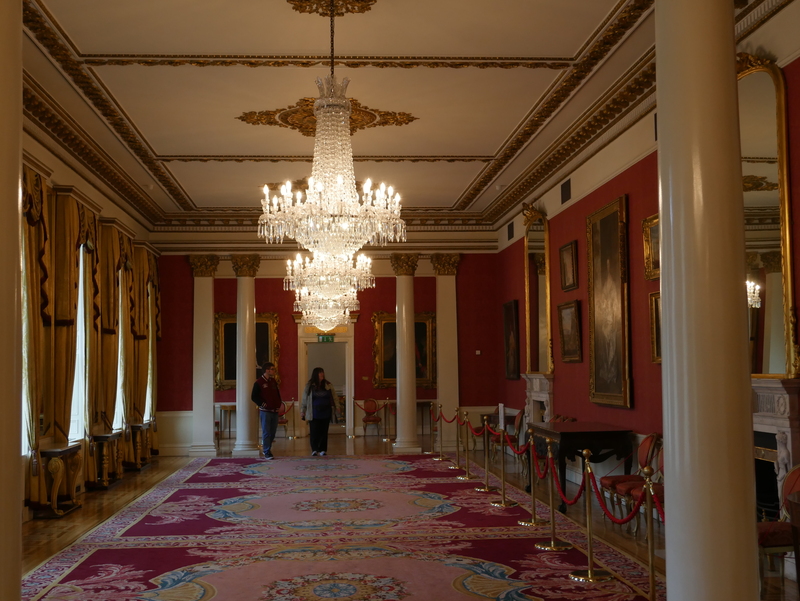 Waterford crystal chandeliers, thrones, magnificent paintings and fantastic design in every. single. room. 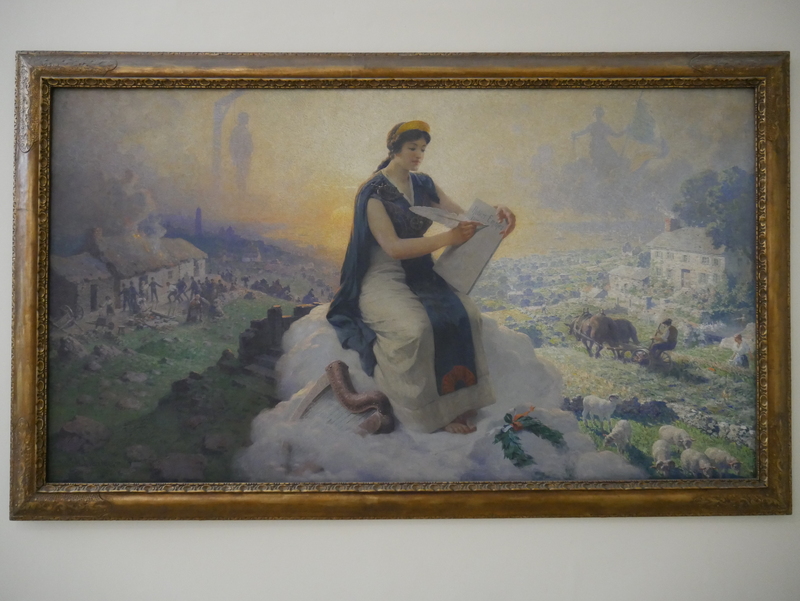 This painting, kind of tucked out of the way as you exited the castle was probably my favorite. It so perfectly depicted the history and struggle of the Irish Republic. It’s beauty was just so haunting and my picture of it really doesn’t do it any justice. 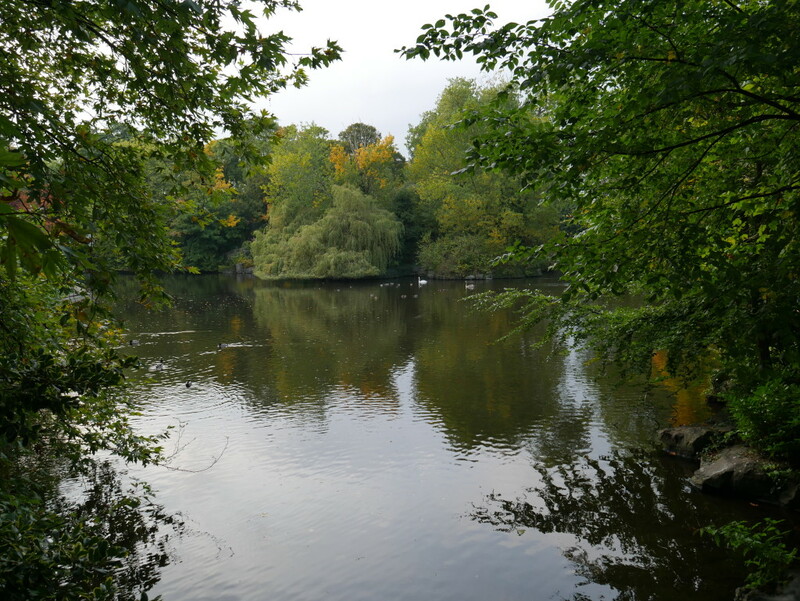 We wandered into St Steven’s Green afterwards and to say it was magical feels like a bit of an understatement. It’s a perfect place to take a walk and enjoy a beautiful evening. 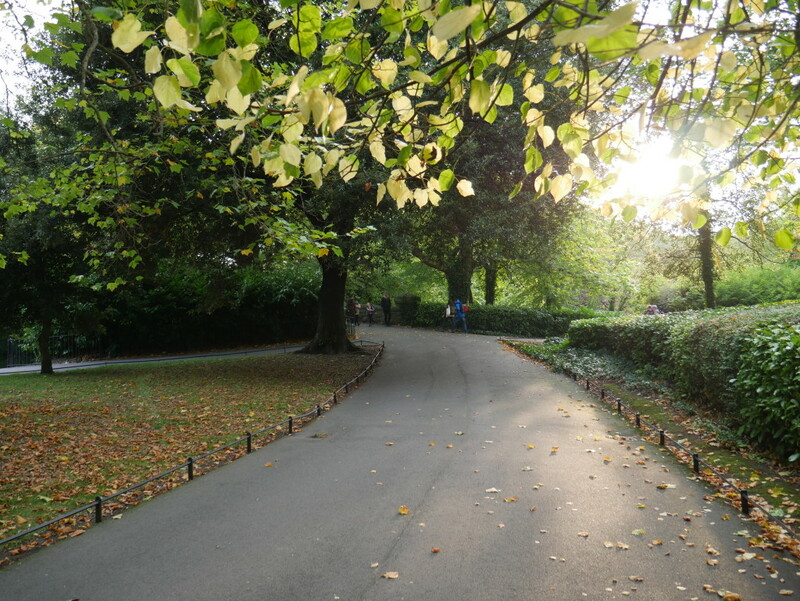 It’s located RIGHT next to Grafton street, Dublin’s main shopping center, but once you entered the park, it was magnificently quiet and serene. It was the best way to end our first full day in Ireland. 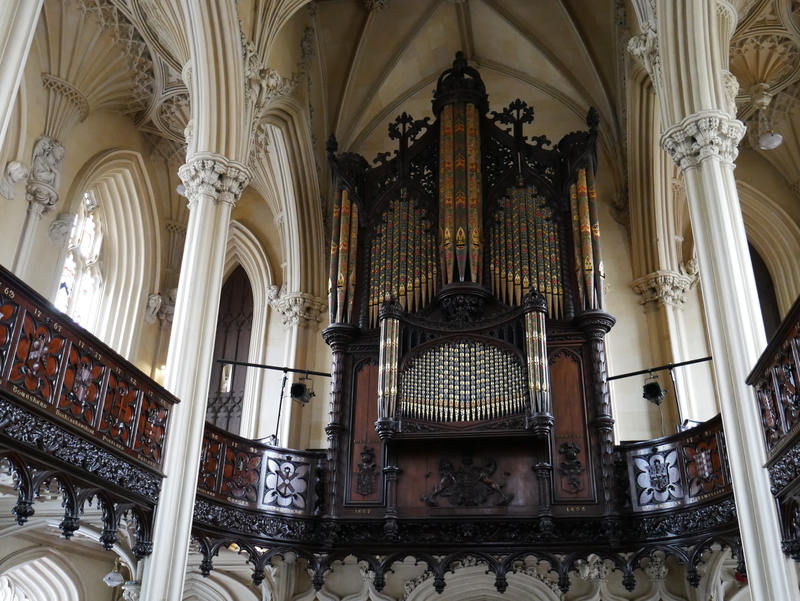 I wish I could fit in our entire time in Dublin into one post but honestly, there was no way that I was going to be able to fit even a quarter of the things we did into one post. 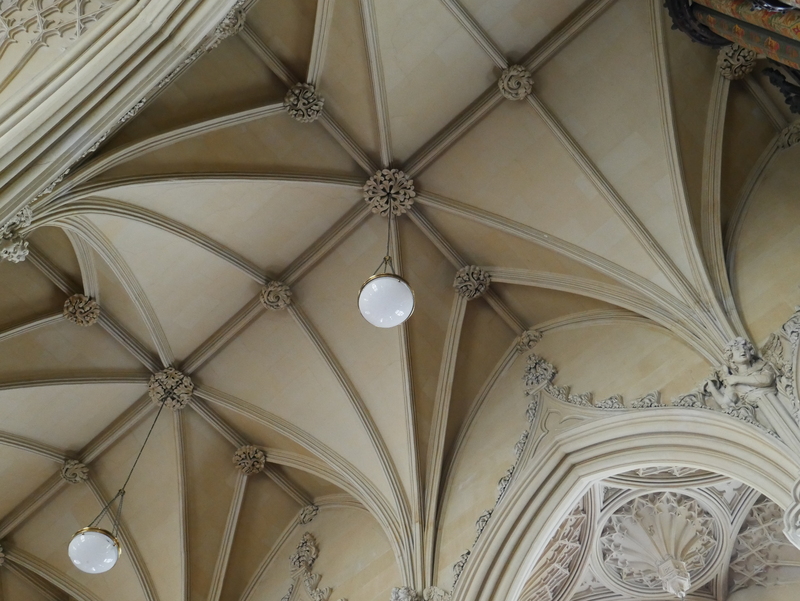 I do feel like I kind of warned you with the title of the post being: Traveling Ireland: Dublin Part I. I promise that I’ll only post one more post about Dublin and try to cram in as much as possible. Have a great hump day and with my luck wish this awful jet lag! 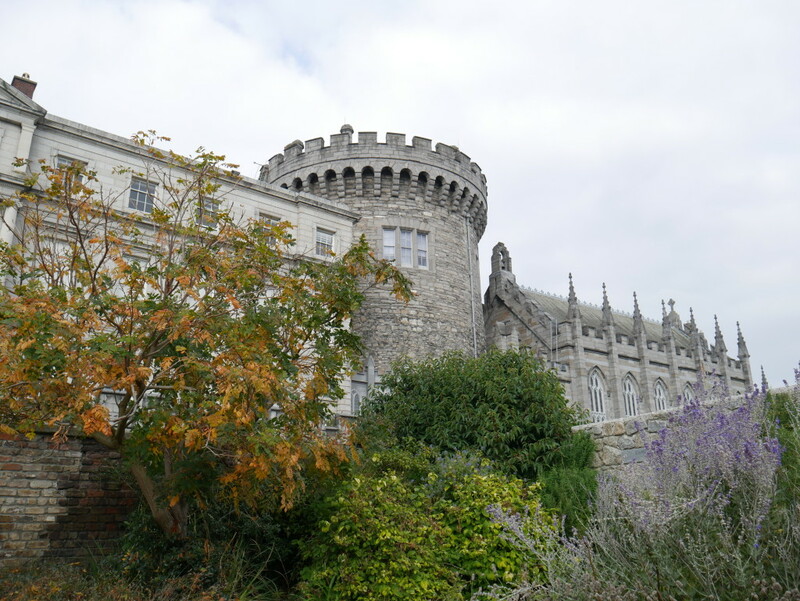 I was able to go to Dublin for a couple of days when I studied abroad in England. It was lovely – we visited many of the same places as you! 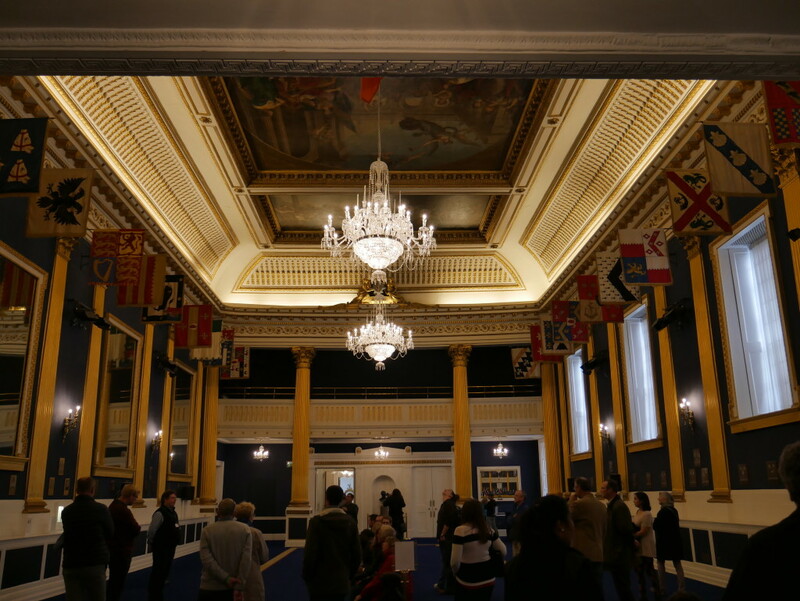 I really enjoyed Dublin Castle, the rooms inside are so beautiful. beautiful photos! i have been thinking about going to ireland for a while, U2 being my favourite band! one day! It’s worth the trip, especially since getting over there is so cheap right now and the euro is down against the dollar! 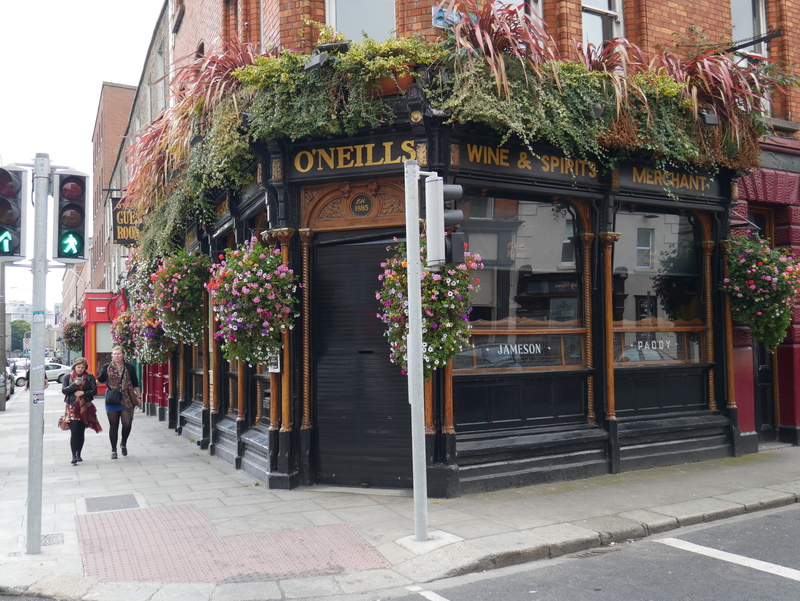 That ONeills merchant – is that a shop or a pub? If it’s a pub, I could definitely see myself stopping by for a pint often! It’s so pretty! We loved it too- definitely thought it was like a european Austin!